Head back in time to the middle ages in Black Knight. Created by Barcrest, this 5 reel, 10 payline video slot is a simple one. The highlight is the free spins round that comes with expanding and locked wilds. Play on your PC, tablet or mobile from between 10p and £500 per spin. There are few design flourishes in Black Knight. The reels are set against a forest backdrop with a castle on the horizon. Watching over the action is the Black Knight on his horse. On the reels you’ll see sceptres, rings and maps which pay 1, 2 or 10 times your bet followed by the orb and crown which award 2, 4 or 20 times your bet. The jester and queen come next awarding up to 50 times your bet. The most lucrative symbol is the king which awards 10, 50 or 500 times your bet if you land 3, 4 or 5 on 1 of the game’s 10 paylines. The Black Knight of the title is the game’s wild. It doesn’t offer any pays but does replace everything apart from the bonus-triggering scatter. The main extra in Black Knight is the Free Spins Bonus feature which is triggered by landing 3 or 4 bonus symbols on the same spin. Your reward is 7 or 12 free spins. Land 5 bonus symbols and you’ll automatically trigger the jackpot and with it a payout of 500 times your total bet. Look out for the Black Knight wild on the 3 middle reels as it will expand and remain locked in place throughout the feature. You’ll also be given the chance to up your stakes and play in Big Bet Mode. For a £20 investment, you’ll get 5 linked spins. The paytable increases during these spins. Trigger the bonus round and whenever the Black Knight wild hits it expands to fill the reel and locks in place for the rest of the round. This certainly isn’t the flashiest video slot you’ll see. The visuals and generic soundtrack are very simple. It’s a similar story with the gameplay where the Free Spins Bonus feature offers the best opportunities. 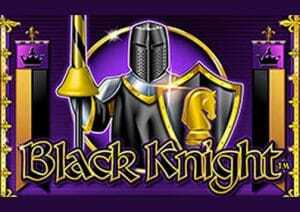 Black Knight is a typical Barcrest video slot. It will be a bit too basic for some tastes. If you enjoy the mediaeval theme, then it could be worth a look. If you’re a keen player, you would have noticed there’s a Black Knight WMS version – WMS and Barcrest are part of the Scientific Games group. Anyway, the WMS version is very similar but is more volatile and offers bigger payouts. I’d go 1 step further and play Black Knight II (also from WMS) which is even more high variance. T&Cs Apply 18+. UK customers only. Free spins 20p each, valid for 30 days. Selected games and deposit methods only. T&Cs apply.